← gantry 3D construction printer is printing in Dubai! EarthTronics, dedicated to developing innovative energy-efficient lighting products that provide a positive economic and environmental impact, introduces its new line of high-efficient LED 4-foot Wrap Fixture Series with advanced lighting control capabilities for offices, stairways bathrooms and storage areas for new construction and retrofit commercial projects. 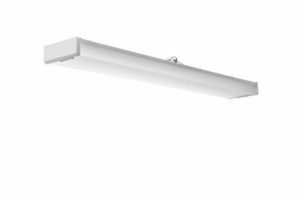 Available in 4000k and 5000K with an 80+ CRI, the LED 4-foot Wrap Fixtures from EarthTronics provide 4410 lumens, operating at 120-277 volts. They are equipped with a 0 – 10-volt continuous dimming driver with a dimming range capability of 10 to 100 percent. Advanced control options include daylight harvesting as well as motion detection. An optional emergency light battery pack and driver is available. The LED Wrap Fixtures have a 50,000-hour performance life. For more information about Wrap Fixtures from EarthTronics, visit https://www.earthtronics.com/products-page/led-fixtures/wrap-fixtures/. Founded in 2007, EarthTronics, Inc. is a Michigan based company located in Muskegon. Our products are sold under the EarthBulb brand name and are found in commercial buildings, hotels, restaurants, retail stores and residential homes. All EarthBulb lamps provide over 80 percent energy savings. EarthTronics energy efficient lighting solutions include LED light bulbs, linear LED and LED Fixtures. EarthBulb LED solutions are excellent for decorative and display lighting, downlights and general area lighting. EarthTronics covers it all. EarthTronics has warehousing in the United States and Canada. More information can be found at www.earthtronics.com.